Cline Rents offers a number of excavators with different buckets and attachments to meet your needs for excavating in Bothell. Excavators are extremely versatile machines that can be used in a variety of situations. While their capabilities overlap with other pieces of equipment in some areas, their ability to adapt to needs is almost unparalleled. 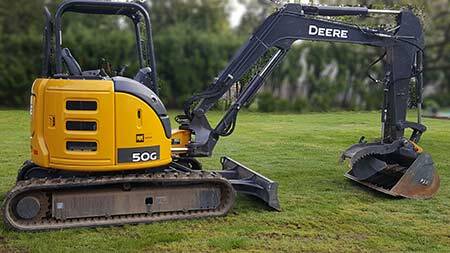 We have a variety of attachments that make our Bothell excavating rentals well suited to a range of needs. Many times in combination with excavation equipment we see people with the need for a dump trailer. These trailers with the hydraulic lifting beds work well for things like topsoil, bark or compost. People also find them to be convenient when they need to get bedding or feed for their animals or take a load of trash to the garbage dump. If you have a large property it can be useful in moving large objects around. We have two different sizes for you to choose from, that will work for most of your needs. Our 10 foot Doolittle Trailer offers a 7,300 pound payload capacity while our 12 foot Maxey trailer offers a 9000 pound payload. We do a good amount of dump trailer rentals in Bothell and the surrounding Mill Creek area as you might expect. We even sell or rent tow ball hitches for your convenience. Check out our technical information page about Dump Trailers here.